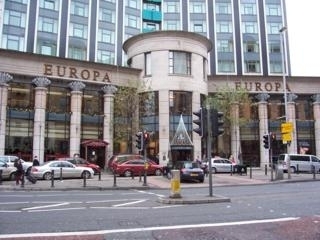 The Europa Hotel has a few bars inside which serve food and the staff were willing to order taxis late at night. Also, the hotel is near one of the citys main rail and bus stations where a taxi can be easily accessed safely. Have you got Google Earth on your computer? If so, then download the Google Earth view of The Europa Hotel. Is this the wrong position for The Europa Hotel? If you think so, then modify its position. Click / Tap the button above to get directions from where you are to The Europa Hotel. I love the Europa, especially the Piano Bar upstairs. OK, so the drink is a wee bit on the pricey side, but the relaxed, sophisticated atmosphere, which paradoxically remains unpretentious, more than makes up for it. The staff are not just incredibly polite, but they are friendly, warm and chatty. They quickly get to know your face, and even set us up a table when the place was bunged one night. I even enjoy the odd bit of banter with the guy responsible, and quite often as he sees me comes in, he knows to start pulling a pint of the black stuff! Because the Europa is used for weddings and functions on Saturdays quite a bit, this night of the week can occasionally be a little loud in the Piano bar, but it's still much more acceptable than most bars in Belfast if you're just looking for a drink and a chat. It's also brilliant post-work on Friday for knocking back a few relaxing ones, as it is one of the few venues in the centre of the city that is not absolutely bunged to capacity. Obviously, its central location is another plus point. The only negative thing of which I can think is the expense (?3 pint of Guinness, ?2.70 pint of Tennants), but to be honest, most city centre venues aren't far behind it anyway. the bar beside it is a class act. bar staff are incredibly fast and efficent and discrete!.